Much like last week's double episode, this week's merge episode felt like two crammed together. The first featured the merge reveal, followed by the surprise return of the fallen, then the re-entry challenge, and the ups and downs that followed that. Then there was a more pedestrian merge episode, where the now 13-person Vata tribe had to vote someone out. In that one, the dominant alliance stuck together and picked off a threat, while a coalition of smaller minority alliances ate themselves. This part was both predictable on its face, and somehow also completely inexplicable, mainly becaue of the lack of time left in the episode, due to the first half. So, given that there's no real requirement to stick to the structural strictures of reward challenge/ immunity challenge/ Tribal Council — especially in this season where nobody is really out of the game and there are no exit interviews (until now, at least) — here's a more daring edit that could have worked better: Spin off the first half into its own episode, and have two merge episodes. Had the show not larded up Episodes 5 and 6 (last week) with four challenges and two giant, complicated Extinction treasure hunts AND an idol find, the Extinction reveal/ return might have worked well as the third act to Wendy's boot episode. Close it out on Keith and Wendy's departure from the Edge, then launch into a fresh episode the next week, starting with Rick's attempts to re-integrate himself into the Vata tribe. There was clearly a lot going on there, almost none of which we saw. We barely even saw Joe, who was booted. From the moment Joe Anglim's presence in the cast was announced, everyone knew that (1) he would probably make it to the the merge by winning challenges, and (2) going into the merge that Joe would be the #1 target the second he failed to win individual immunity. And lo and behold, he was. So the only real intrigue was minor dissension within the Kama ranks, with Julie leading a charge to take out Kelley, instead. (Julia also was not on board with voting out Joe this early, which was at least consistent with last week's narrative, but was ... not shown.) From the way the vote broke down, there must have been even more substantial dissension within the original Manu ranks. Why? Well ... there was no time to find out. This all led to a four-way split in the first post-merge vote, one that barely made any sense, even considering the helpful return of the votes being shown over the bootee's final words. Was this a brilliant ploy by the six-person (still technically a minority with 13 left) Kama alliance to divide and conquer what otherwise might have been a seven-person majority (Joe, Aurora, and the five original Manus)? We'll never know. Just one of many questions this overstuffed merge left unanswered. Was Joe's flag painting and corresponding lack of scrambling (semi-) intentional? With the Edge of Extinction twist now explained, did Joe connect the dots and see the obvious parallels to Ozzy's path to a near-win in South Pacific? It's hard to say for sure, because (again), we saw very little of Joe and his post-merge thoughts this episode. We were shown (from Kelley's perspective) her attempt to build on their mutual Cambodia past, in the one strategy discussion in which Joe appeared. In that, he accurately laid out the Kama dynamics to Kelley, so it's not like Joe was unaware of his position in the Kama hierarchy. So was his non-scrambling just his fallback position after not winning immunity? If so, it was probably the best move he could have made. 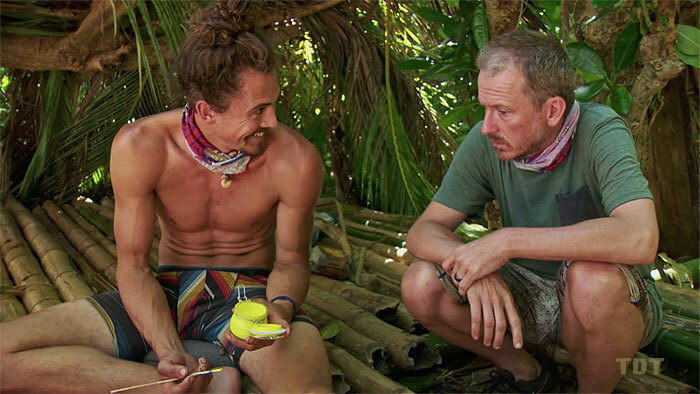 By not being seen as actively plotting, Joe keeps his hands clean, can now shift his focus to winning the final return challenge, and will have a solid story of carrying the Kama tribe on his back through the pre-merge, only to be rewarded with their collective betrayal at the first opportunity. Not only that, but by winning his way back in, he'll again prove his worth, and (as with Ozzy), he can catch fish and establish relationships with probable jurors while on Edge of Extinction. His comments as he grabbed the Extinction torch ("Just left the door wide open. Worst thing they could have done") certainly back up that interpretation. It's just not obvious that it was by design. Still, it's not impossible that Edge of Extinction was exactly the briar patch into which Joe was begging not to be thrown. Julie sprang into the edit this episode as perhaps the true strategic leader of the (early) post-merge. She set the moral tone for Kama in not wanting to immediately target the just-returned Rick. While voting out Joe was Ron's idea, Julie presented and explored other options (Kelley). As such, her quote that the merge vote is important because "it can dictate the rest of the game" seems to carry a lot of weight. Did the Kama Six get this vote right, or did they screw it up? Clearly, they won the battle. Did they win the war? The season has focused almost exclusively on the Manu/Lesu people thus far. It's possible that this was done to raise the stakes of the re-entry challenge at the merge. More likely, though, the Kama newbies will fall apart. This episode felt like an indictment of most of the people in power who were shown plotting (except maybe Julie), mainly because they've either been shown previously to be antagonists to central characters (Kelley, Lauren) and resumed that role here, or because we've barely seen them before (the Kama six). For example, this was Ron's very first Tribal Council, ever. His role in strong-arming the Kama majority into voting out Joe, over a (mis- ?) perceived slight as Joe painted the flag, felt like a betrayal, especially in context of his reversal last week, and professed interest in working with Joe. We still barely saw Eric and Gavin. After Victoria emerged as a strategic star last week, she almost completely disappeared this time. This season continues to be a weird one, edit-wise, but the most likely interpretation is that the Kama Six's stranglehold on the game is probably short-lived, and the outnumbered minority group that's now holding three idols between them is about to take control, just as the advantage-laden Davids did last season. Then promptly blew their hard-won majority by targeting each other. Yeah, that sounds about right here. One other bit of foreshadowing: Both Julie (at the merge feast) and Victoria (at Tribal, in front of the jury) voiced the position that targeting someone who had just fought their way back into the game from Edge of Extinction crossed a moral line, and shouldn't be done. Certainly, the three current jurors, all of whom have spent a lot of time on the Edge, most likely agree with that sentiment. Future jurors probably will, too. Could the Kamas have just shot themselves in the foot here? 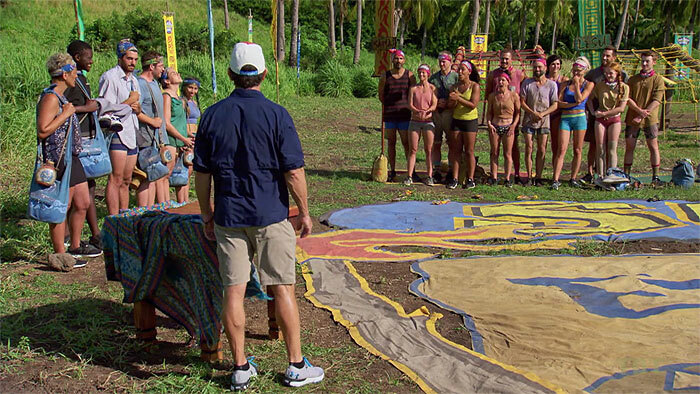 Given the likelihood that the final return challenge will take place at the start of the finale, the person who comes back in at that point will likely have just one more individual immunity challenge (F5) to win, before F4 firemaking kicks in. If it's seen as an immoral act to vote against that person at their first post-return Tribal Council, they pretty much have a free pass to the finals, especially if they're good at making fire. Who's the person most likely to re-enter now? The guy they just voted out, Joe Anglim. Whoever it is, even with a potentially 13-person jury, the final person returning from Edge of Extinction appears to have already banked a significant number of jury votes. 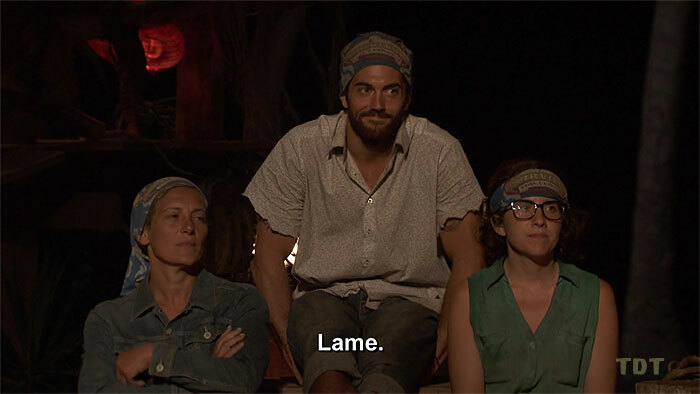 As amusing as it would have been for Reem to vote on people she never met — and only saw during the marooning and at one challenge — having the people still on the Edge attend Tribal as "the jury" was obviously the right decision. 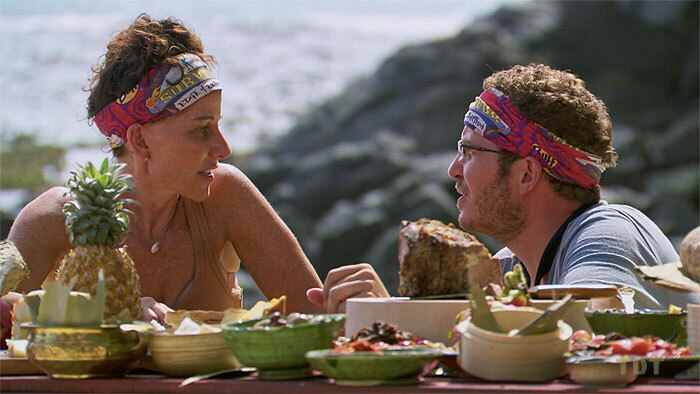 This corrects a flaw in the Redemption Island format, where people like Matt Elrod and Ozzy Lusth, who spent a lot of time there, were unable to watch Tribal Council until most of the post-merge was over. It's one thing to hear the stories from the booted contestants, it's another to see first-hand how the vote went down. Having an informed jury is always better. The best part, though? While Aubry supplied the snark on the Joe boot (above), the prospect of Reem caustically whispering about the proceedings from here on out should be a great antidote to the increased theatricality of modern Tribal performances. Reem doesn't have time for your hybrid improv/Survivor performance experiment. And yet: Despite Probst finally spelling out the twist for the remaining players at the merge, the rules of Extinction residency vis-à-vis jury service still remain decidedly opaque. Do future post-merge booted players have to go to Extinction if they want to be a juror? What if someone gets voted out really late in the game, say at F6, and elects just to skip the return challenge and go straight to Ponderosa instead, are they a juror? Even though, say, the person voted out two days later at the second F5 Tribal (after the final re-entry challenge) has no decision to make, and are automatically on the jury? What if someone like Reem decides that 30 days on the Edge were enough, and raises the sail on Day 33: Is she kicked off the jury, after sitting through so many Tribals as a juror? What happens if someone needs medical attention at Edge of Extinction, and they have to leave? Are they no longer a juror? So many secrets, so little time. - Meh to the "idol" lower third: On the one hand, it's cool that Probst listened to a fan request and followed through on it. (Just like with beatles20147 and Redemption Island, right?!) 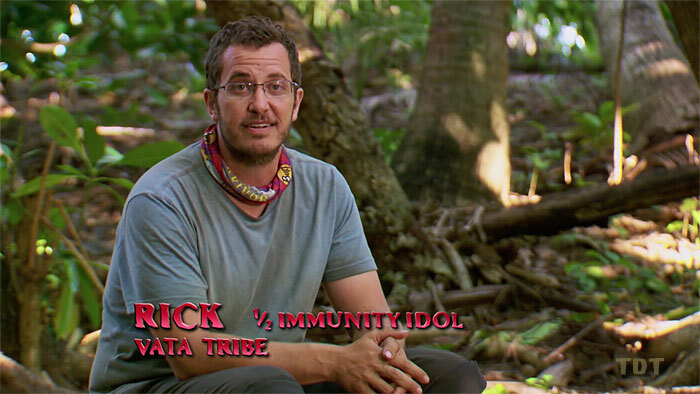 On the other hand, the OP probably meant something more along the lines of adding a little idol icon/emoji next to a contestant's name, not changing Rick's profession to "1/2 immunity idol." - Speaking of Rick's WTF idol... - If you're giving the re-entering player a one-time free pass at Tribal (as with the Outcasts), that's totally cool. It makes complete sense that a fish-out-of-water former ex-player might need a few days to readjust to the real game, and a short-term idol gives them that. But that's not what production did here. Instead, Rick was just given some quasi-idol whose convoluted rules made no sense, except the part that he couldn't actually use it at his first Tribal. That's weird on its own, but now he (and David) has a fully powered idol he (they) can use at any point in the future. Why not just give him an actual one-Tribal idol, like the one Chris Noble got at his merge feast (but didn't use) in Ghost Island, or Davie's second one in David vs. Goliath? What exactly was the thinking here, apart from "Oh gosh, Rick won! Look at that hangdog expression. He's learned his lesson! Let's get him a present!" ... "But not until next episode, or he might end up a sleazy male stripper, like the late Earl Warren." - A surprisingly well-handled Extinction edit: The first exits from Edge of Extinction were handled much more respectfully than Jeff Probst's pre-game comments might have otherwise suggested. No recriminations about "quitting," and Wendy and Keith each were given a chance to explain their decisions. From their exit interviews, they were unaware that by leaving on Day 17, they were forfeiting a chance to be on the jury. But that's not too surprising, since (as mentioned above) the jury rules are anything but clear. What is clear is that living on the Edge of Extinction is difficult — more difficult than the standard game, because there's virtually nothing to do there — so it's good that the show is not tarring these decisions as quitting. Online fans have that more than covered already. Gordon Holmes at XfinityTV.com: "Who's Got the Edge?" Dalton Ross at EW.com: "Two people quite Edge of Extinction"
Stephen Fishbach at People.com: "Survivor: Edge of Extinction Is Upended as a Contestant Returns"
Andy Dehnart at Reality Blurred: "Survivor: Edge of Extinction's merge episode was a hot mess"
Dalton Ross at EW.com (3/28/19): "Keith reveals real reason for feud with Chris"
Josh Wigler at The Hollywood Reporter (3/28/19): "First Eliminated Players Speak Out"
Gordon Holmes at XfinityTV.com (3/28/19): "Keith: 'The Boredom, Anticipation, and Reflection Breaks You'"
Dalton Ross at EW.com (3/28/19): "Wendy explains why she 'never quit'"
Gordon Holmes at XfinityTV.com (3/28/19): "Big Wendy: 'I Knew My Tribemates Would Not Die if They Didn't Eat (the Chickens)"
Rob Cesternino & Stephen Fishbach at RHAP: "Know-It-Alls | Edge of Extinction Episode 7 Recap"
Rob Cesternino at RHAP: "Randy Bailey Recaps the Episode 7 of Survivor: Edge of Extinction"
John & Matt at The Purple Rock Podcast: "Edge of Extinction Episode 7: There's Always a Twist"
Dom Harvey & Colin Stone at The Dom & Colin Podcast: "[title tk] -- Episode 7 Recap/Analysis"